On 18 Jun 2006, Brian Ma visited the United States Marine Corps War Memorial in Arlington, VA, United States. He took several photographs of the memorial that depicted the second flag raising on Mount Suribachi and shared these photographs with the visitors of WW2DB. "The raising of that flag on Suribachi means a Marine Corps for the next 500 years", said Secretary of the Navy James Forrestal upon hearing the news of the Mount Suribachi conquest. This statue now honors all personnel of the United States Marine Corps who have died in the defense of their country since 1775. 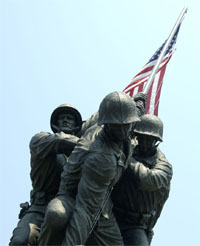 For more information on the battle for Iwo Jima and the flag raising, please see this article. 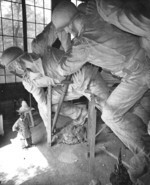 Some photographs of sculptor Felix de Weldon working on this memorial had also be added to this gallery. A Suggestion: Because of the memorials depiction (Iwo Jima), I believe that the flag flown on the memorial should be a 48 star flag. It would add just the right touch of history to a an otherwise moving tribute to valor. USMC BULLITIN 3rdMARINE DIV.1945 TELLS IT ALL [CAN COPIES OF SAME BE OBTAINED] BY VETS? 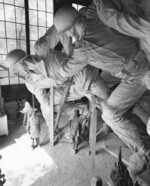 where can i find more info on the iwo jima memorial? I was privileged to know three Iwo Jima Vets, who have all passed now. I was trained as a recruit by one them. I have higher respect for these three men than any I have know in my life. My prayer is that all future generations will understand the valor these men possessed. Good Bless the US Marines!! All men will die... I will die a US Marine. Does anyone know where I can find a real good detailed picture. I recently heard that there are 13 hands raising the flag, 10 for the Marines, 2 for the Corpsman Doc Bradley and 1 for God. Anyone else hear this?? Oh yeah Oorah Sgt. Reyes. Number of hands There are twelve hands in the memorial corresponding to the six figures depicted. A persistent rumor has attributed the existence of a thirteenth hand to the sculptor's wish to symbolize either all the other Marines who made the flag raising possible, or the hand of God. When informed of the rumor, the original sculptor, Felix de Weldon, exclaimed, "Thirteen hands. Who needed 13 hands? Twelve were enough." I have a set of dog tagsand some Marine pins and Marine ring that belonged to a Jim Lewis, jr. He was Roman Catholic. They were in items that my father had stored away from his WWII days. Not sure who Mr. Lewis was to my father, does anyone know who I can give the tag number to and find out more about Mr. Lewis and his relationship to my father. My uncle, Louis S. Bourdelais was part of the initial Marine landing on Iwo Jima. Does anyone have any info about him? Thank you.